Rachael is fantastic! Seriously. I really couldn't imagine having worked with anyone else as our coordinator. Rachael is of course professional, super organized, and knows the ins and outs of the wedding industry--all the basics you expect in a coordinator, but a few things really set her apart. One, I completely trusted her sense of style and design. I had total confidence that on the day of the wedding any last minute decisions that had to be made or in supervising the set-up, the end result would be beautiful and account for my tastes. Second, Rachael knew all the right questions to ask me to make sure we had our bases covered, but she did it in a way that didn't make me panic or feel overwhelmed. Third, she quickly adapted to my fairly direct/no-drama approach to planning and really helped to translate that working with the vendors. Everything went so smoothly on the day of the wedding and I know a huge part of that was because of Rachael. The day was so perfect I wish we could go back and the whole thing again! Having Rachael on your team is like having wedding superpowers! We give her our highest recommendation. Great listener: Rachael listened to our goals for our wedding, and helped us realize them. She heard everything we were saying, asked very good questions, and was incredibly thorough in keeping track of everything we told her. Amazing organization: Rachael wrangled us and all of our vendors (from near and far) into a detailed timeline without it feeling at all forced or contrived. In the last six weeks before our wedding, Rachael was in constant communication with our vendors to ensure a smooth wedding day. Calm: On our wedding day, Rachael calmly took the reins. She managed the event with grace, and stayed cool when minor issues arose. All we had to do was enjoy our wedding. Above and beyond: Rachael exceeded our expectations! When we needed a small table for our ceremony, she offered to bring one from her house. Her services are an incredible value. Rachael is a PHENOMENAL wedding planner. She is effective and great to work with. My husband and I agreed that one of the smartest decisions we made for our wedding was hiring Rachael. The Ruby & Rose team pulled it all together on our wedding day and Rachael was there from start to finish. She was very available and patient whenever I had a concern or question or just needed a second opinion. She is VERY organized. If you are looking for someone whose logistical game is on point look no further. She created spreadsheets and diagrams and lists of action items and kept us on track when we felt overwhelmed. She took care of all the execution details and really helped with the communication with all of our vendors. Our wedding was such a fabulous loving party and Rachael made sure that all of the things that were most important to us came through. We definitely couldn't have pulled it off without her and I couldn't have asked for a better day. We hired Rachael as our day-of-coordinator, and we couldn't have been happier with our decision! We can't say enough about how great it was to work with Rachael -- she was friendly, organized, intuitive and knew exactly what needed to be done! She has great style, and was not only open to, but also helped us with all of our DIY ideas! While we opted for "day of" services, Rachael really started working well in advance of our wedding. We knew we were in good hands after our first meeting with her on a Saturday morning when she starting emailing thoughts, ideas and questions that afternoon. The months leading up to our wedding, she knew all the right questions to ask us and our vendors. She took over our wedding details about a month before the wedding -- she coordinated our vendors, created timelines and orchestrated everything that we needed in the days leading up to our big day. On the day of our wedding everything was executed absolutely perfectly! Rachael was 100% on the ball -- she managed the timeline, set-up and breakdown of the venue, directed vendors, fielded questions from/herded our guests and much, much more, all with a great attitude and beaming smile! She knew how to prod people without ever being overbearing, she adapted extremely well to unexpected items, and made sure we were kept happy, fed and hydrated. She even slotted a few extra minutes in our timeline for us to spend some alone time after the ceremony to take it all in! Because of Rachael, we were able to breeze through our day and didn't have to worry about a thing! And most importantly, she helped us to achieve our main goal: to have a blast on our wedding day! Wow, Rachael helped make our wedding everything we could have ever wanted. We can’t imagine a world where our wedding would have went the way it did without her help. I cannot recommend or say enough good things about our work with Rachael. Originally I was beyond overwhelmed at the thought of planning a wedding. We had some thoughts of what we wanted, but no idea how to articulate, let alone put together our vision. To be honest, when I hired Rachael, I wasn’t sure exactly what a wedding planner did, I just knew that everyone recommended I have one. By the end of our first meeting with Rachael, I understood the importance of having a professional to help you navigate all the details and surprises that come with holding this type of event. 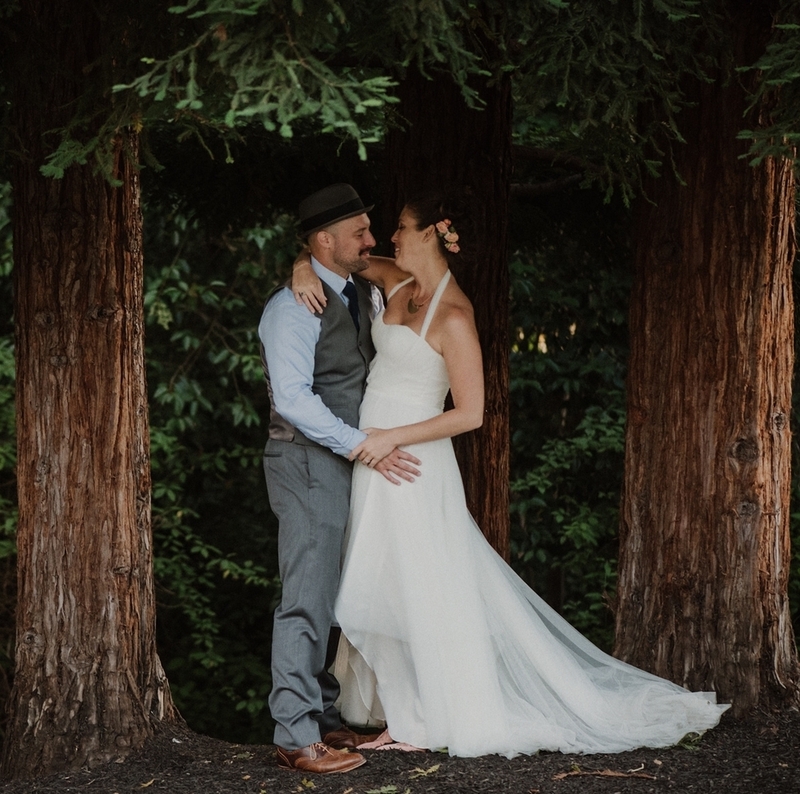 Although I could find budget templates, local vendor supplies, week of and day of checklists online, they are no substitute for having someone else simplify the whole process so that I could focus on the details I found most important, and enjoy the time leading up to the wedding. One tip I highly recommend when working with Rachael, trust her design aesthetic! She has an amazing eye for the small details and ways we could make the wedding personal and unique. When the final day arrived, I couldn’t believe how it all had just flowed with such ease.